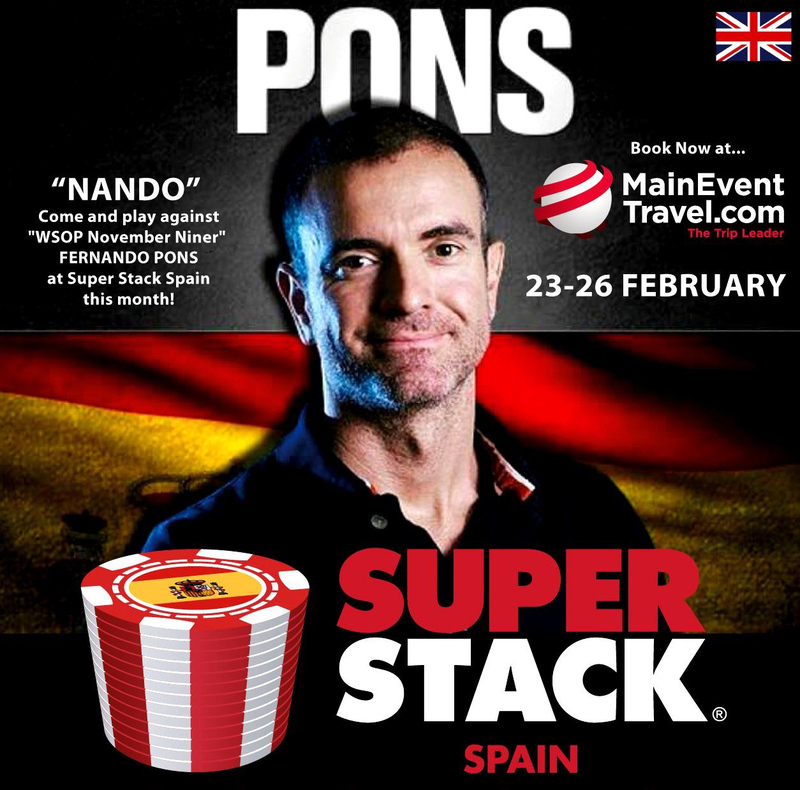 Super Stack® is sponsoring November Niner Fernando Pons at next week’s Super Stack Spain event at glamorous Torrequebrada Casino and Resort, a stunning beachfront location in Benalmádena near Málaga. Pons – known as “Nando” to his friends – finished ninth out of 6,737 players in the WSOP 2016 November final, netting $1 million after qualifying online in a €30 satellite. There are a total of six Super Stack® Spain events this year. The “Nando special” runs February 23-26 at Torrequebrada and, like all Super Stack events, will feature the popular Super Stack® structure with a 30,000 starting stack and 30/40 minute blind levels. Four re-entries are allowed per flight with late registration open for the first 3½ hours. The next Super Stack Spain events run in May, June, September, October and December at Torrequebrada Casino and Resort, located in one of Europe’s most popular tourist destinations, and Super Stack’s deal with MainEventTravel ensures players get to stay in the resort’s stunning 4* luxury hotel at the best rates available. For the forthcoming Super Stack® events in Gibraltar – in March, August and November –MainEventTravel has secured an exclusive deal for players to stay onboard the amazing 5 star Sunborn Super Yacht Hotel, Resort and Casino. Players can choose from two-, three- or four-night stays and the package includes players’ £170 tournament buy-in. Both destinations are easy and cheap to get to. There are numerous return flights to Malaga and Gibraltar that cost well under £100 enabling Super Stack® players the chance to compete in great locations at an affordable cost through Main Event Travel. As part of the new deal, MainEventTravel will be offering all Super Stack® players an efficient and cost-effective travel service designed to meet all their needs and requirements including hotel accommodation and car rental. Where possible, packages will also include the chance to book hotel and tournament buy-ins all in one go, and flights will also soon form part of the overall offer.